Off to the jungle. 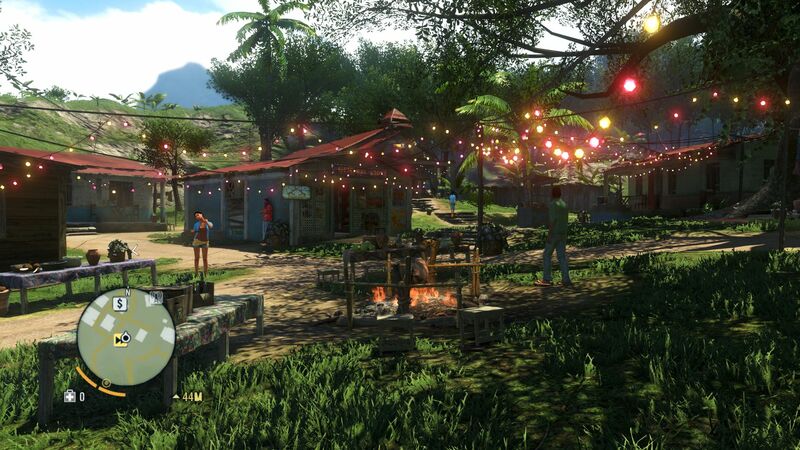 Ubisoft ends the 2012 gaming year with a big bang. 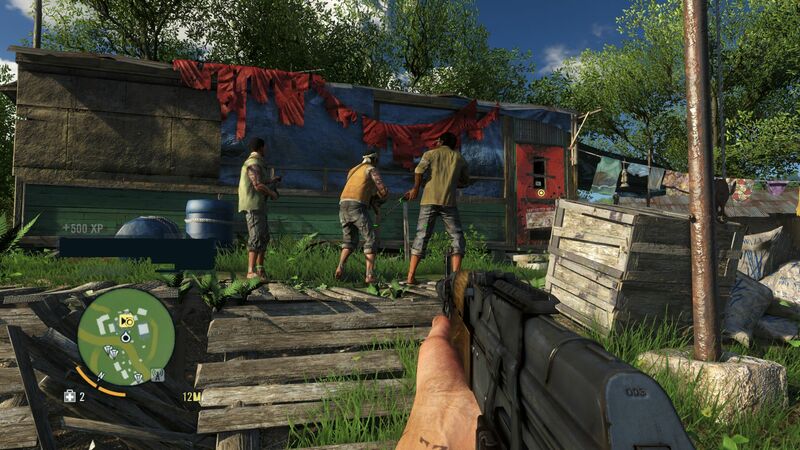 Although it's built with open-world architecture, Far Cry 3 wants to be an intense ego-shooter with a gripping story. But notebook users have more to fear than all kinds of opponents: the Dunia 2 engine can be a menace too. 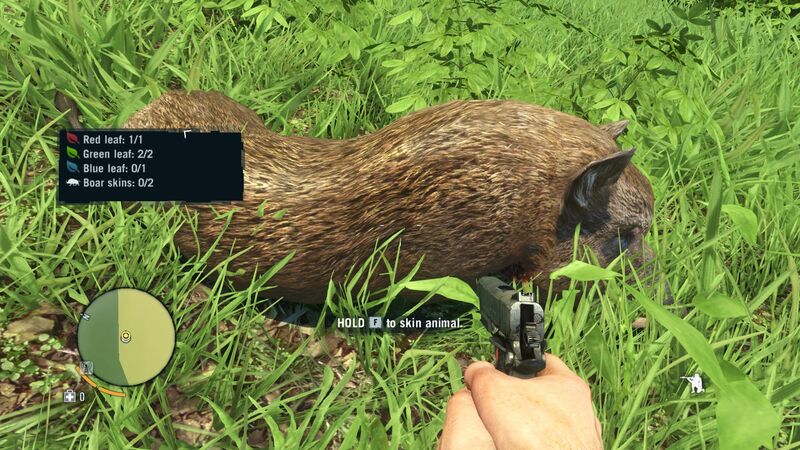 Upon hearing the catchphrase "Far Cry" not every gamer's eyes will light up. Though the first part made a good impression in many respects, the second part, released in 2008, had to pocket some serious critique. 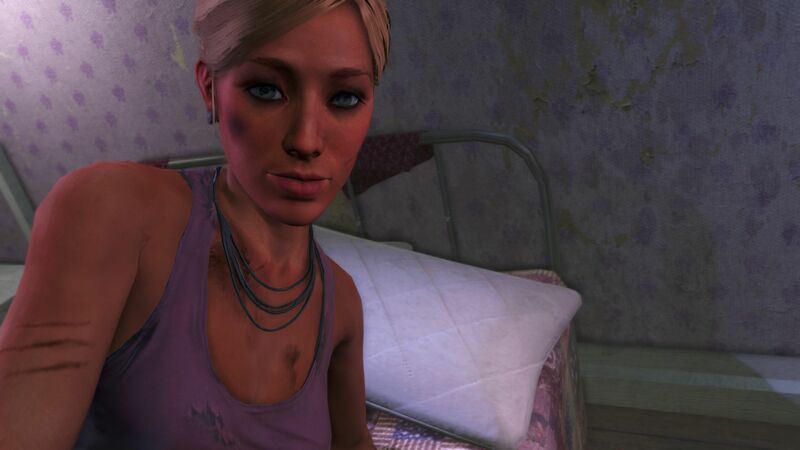 Along with the aimless storyline, critics also denounced the game's limited variation, among other things. Unfortunate design choices like the irritating malaria and constantly respawning opponents made the game even less fun. 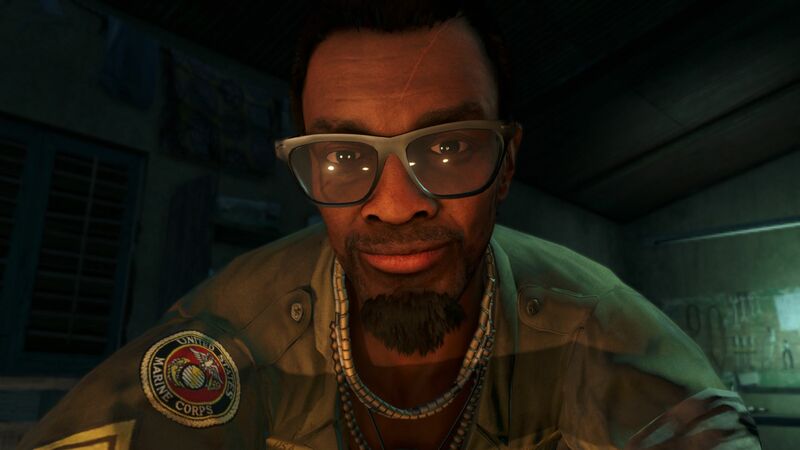 Although Far Cry 1 had its own faults (skimpy storyline, higher level of difficulty, frustrating save-system) no one could deem the successor anything but a step backwards. 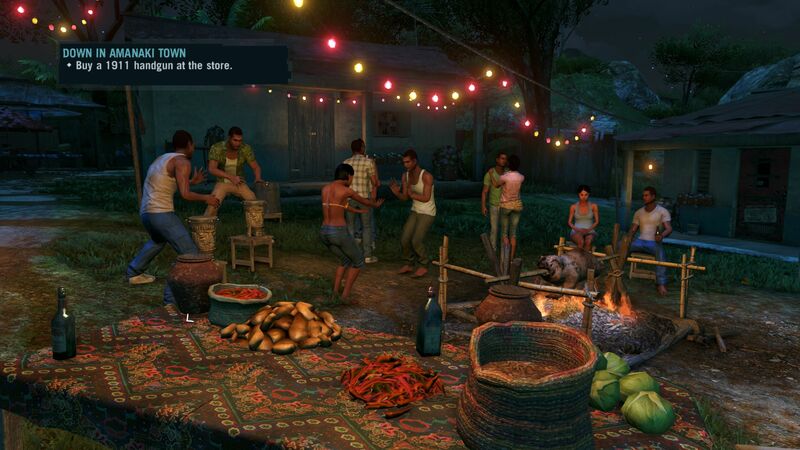 With Far Cry 3 Ubisoft dares to try again. 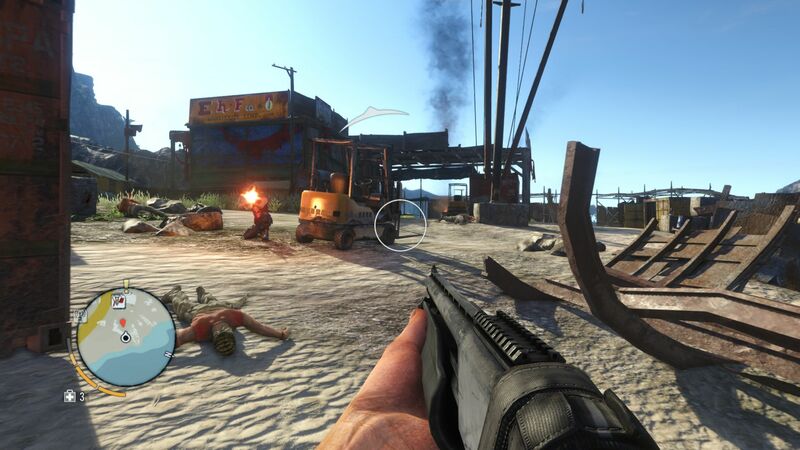 The ambitious open-world shooter shouldn't be inferior to other action titles in any way. Will the plan have worked this time? 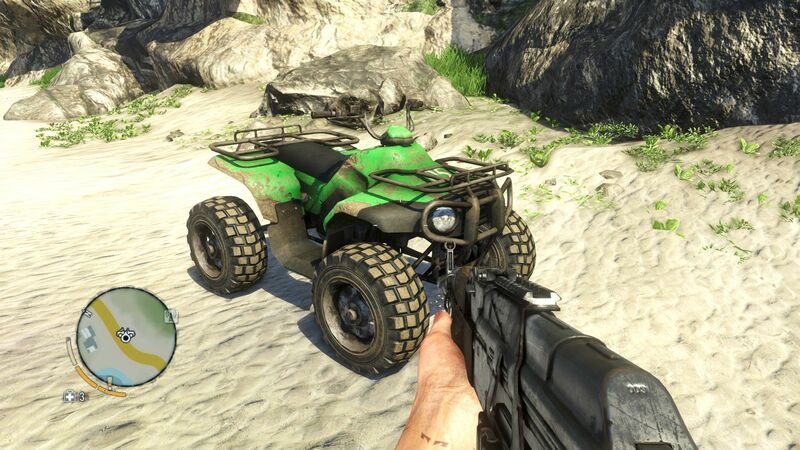 We completed a few missions and investigated the game's hardware demands. 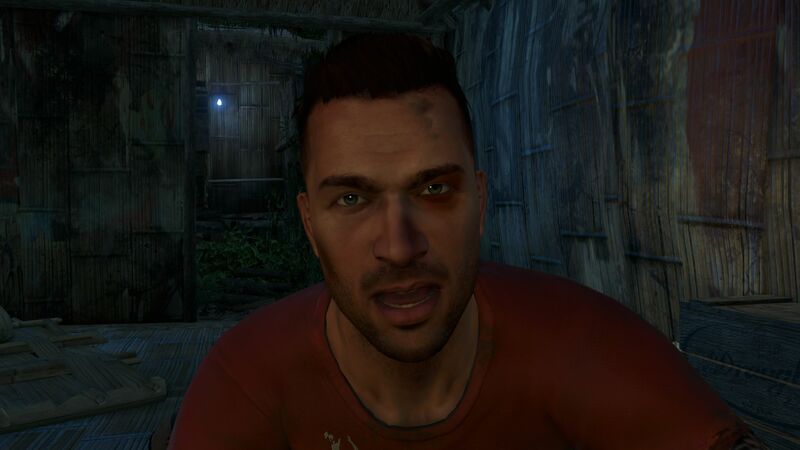 The kidnapper Vaas seems to be a little insane. Grant, the protagonist's older brother, doesn't stay around very long. Such a coincidence: in the first level we already find important utensils. The escape from camp is rather implausible. 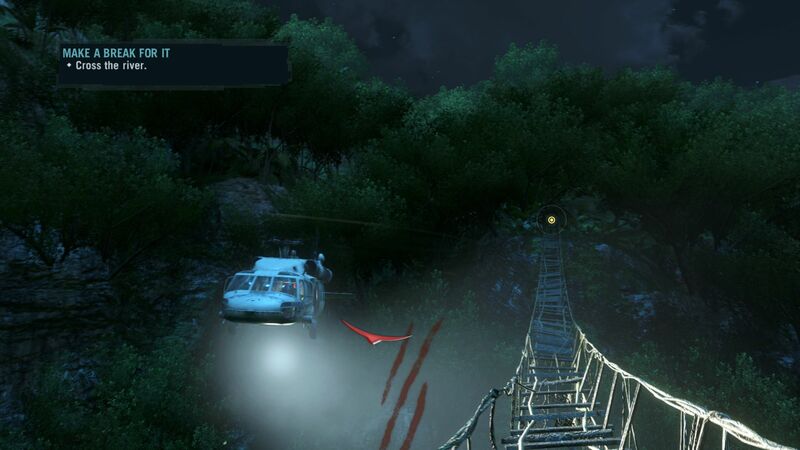 A helicopter right next to the hanging bridge: will that go well? We hurdle through the wilderness at night too. 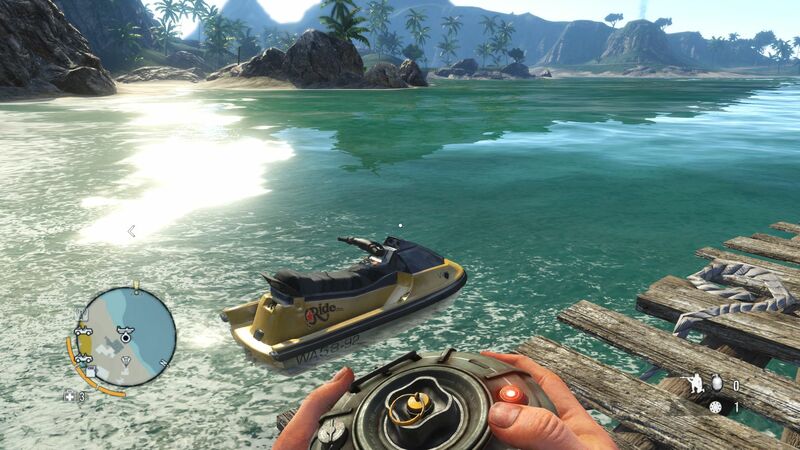 The starting point of Far Cry 3 is as simple as it is exciting. Desiring to experience an adventure and flee their sad daily routine, a group of young people travel to a tropically-inspired island. You have some fun in discos, admire the picture-perfect natural scenery and abandon yourself to all sorts of sporting activities such as skydiving. But the dream-like fun soon turns to bitter reality: the main character, Jason Brody, falls into the hands of local pirates who snap up clueless tourists and demand ransoms to earn a living. 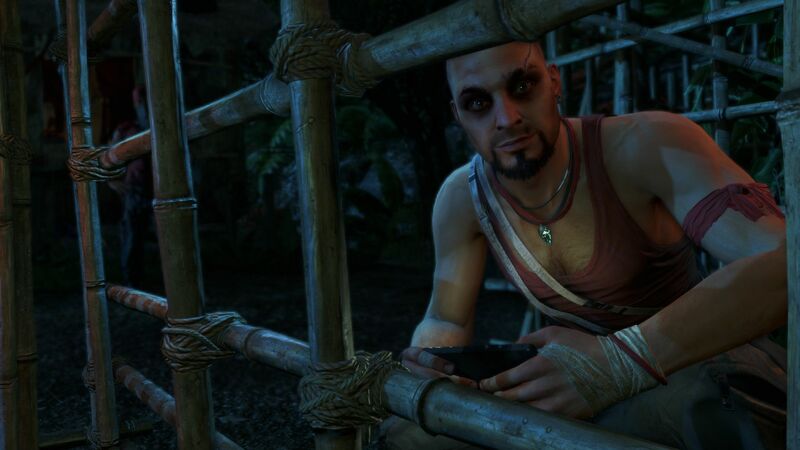 Right at the beginning we meet the well-created antagonist, Vaas. Due to his mentally-unstable streak the guy spurts a kind of "Apocalypse Now" charm. After a short and somewhat disconcerting "conversation" thanks to the help of our older brother Grant, who was also kidnapped, we're able to escape our bamboo-cage. 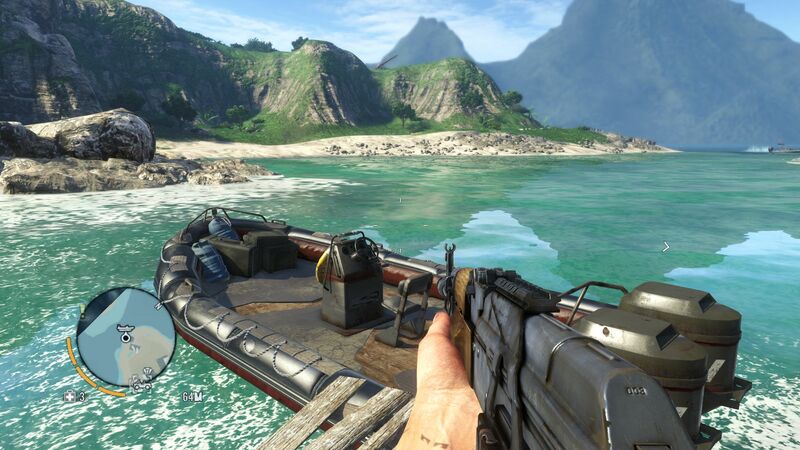 The subsequent getaway makes for a good start, and it suggests that Far Cry 3 doesn't take the whole believability thing very seriously. Like in the stealth passages in Call of Duty we breeze effortlessly past dozens of opponents. When we're discovered by the pirates at last (as the script demands), the protagonist flees into the jungle with his last shred of strength. 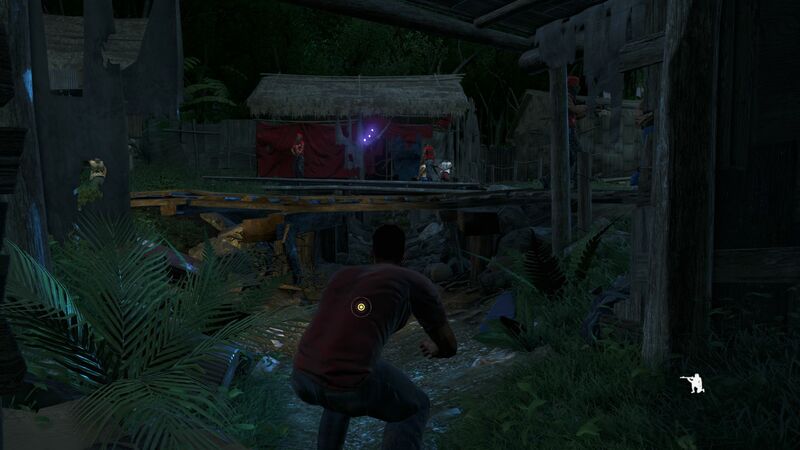 Jason isn't terribly strong though: after a helicopter-encounter the young man falls into a river and has to be rescued by a member of the Rakyat tribe, who nurses him back to health. The degree of detail on the characters is uncommonly high. 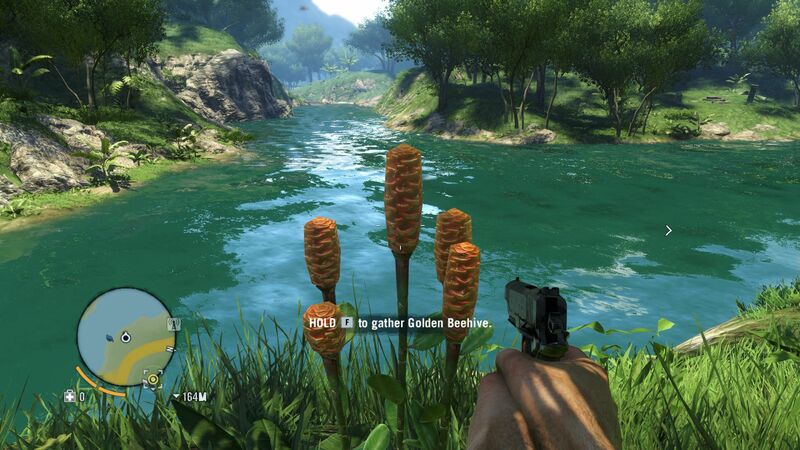 Far Cry 3 portrays the world very coherently. It's not long before the first gun shows up. 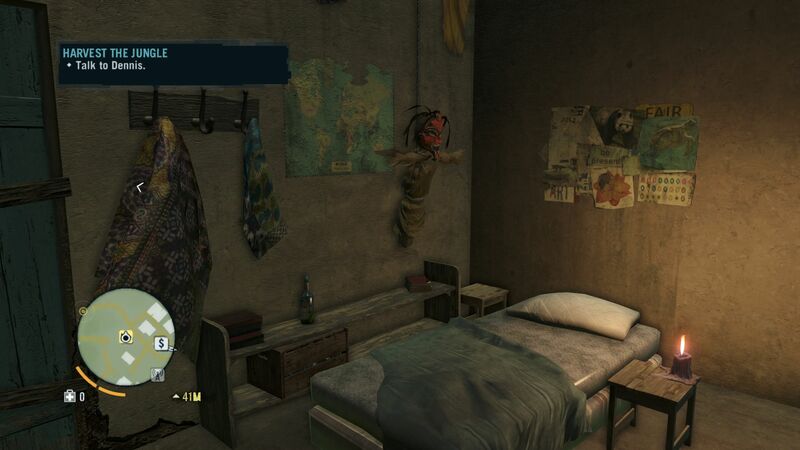 The tribal village exudes a voodoo flair. 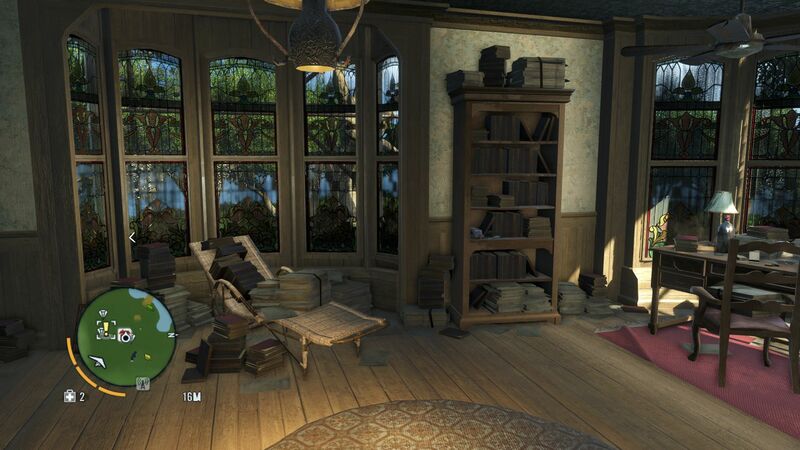 Ubisoft really worked hard on the interior spaces. 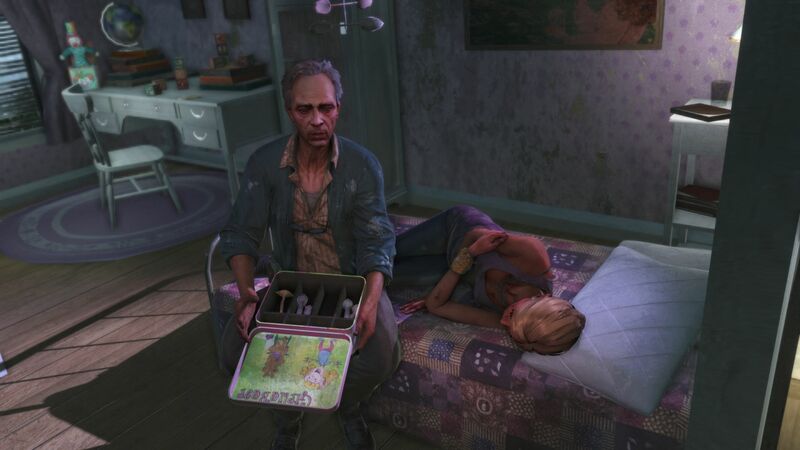 The safe houses are a great alternative to the arms dealer. But what should he be standing around all day blabbering about when there's so much to get done on the island? The developers filled the enormous game world - which for our taste is rather oversized - with all sorts of tasks and side activities. 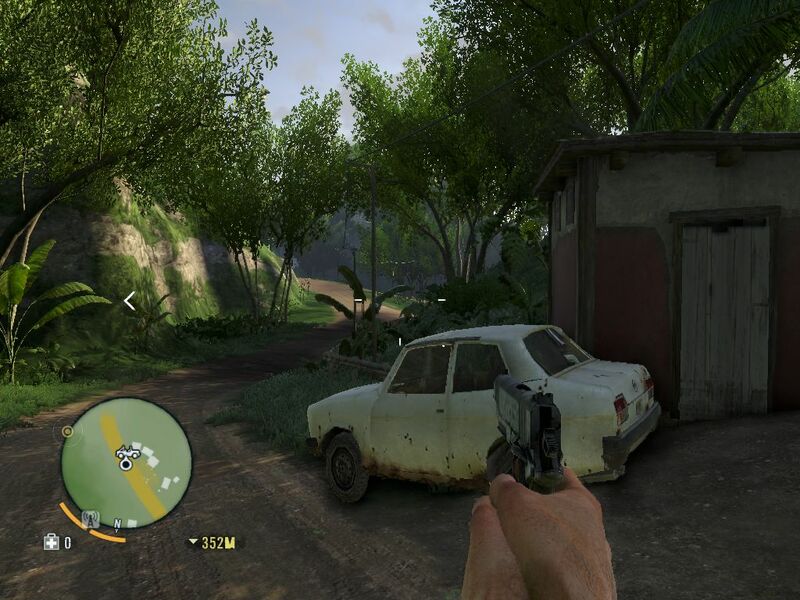 Far Cry 3 offers, among other things, hunter killing missions, tribal examinations, automotive courses and mini games like throwing knives. 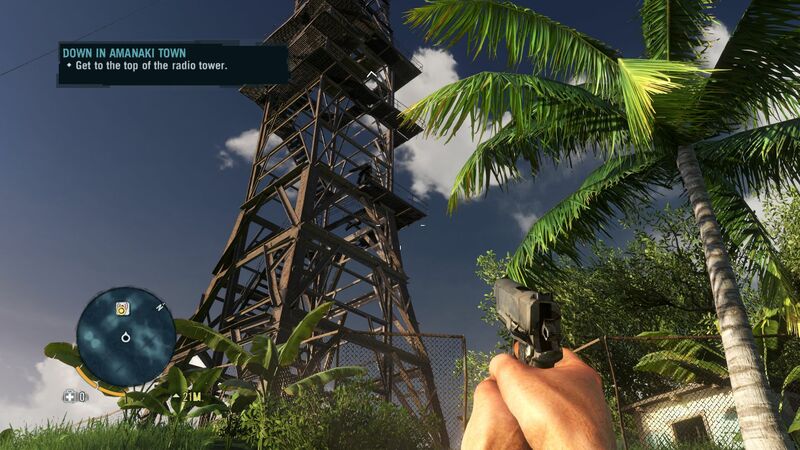 Above all, climbing radio towers (clears the "Fog of War") proves to be essential. The radio towers absolutely ought to be scaled. Without an interfering transmitter there's more information on the card. 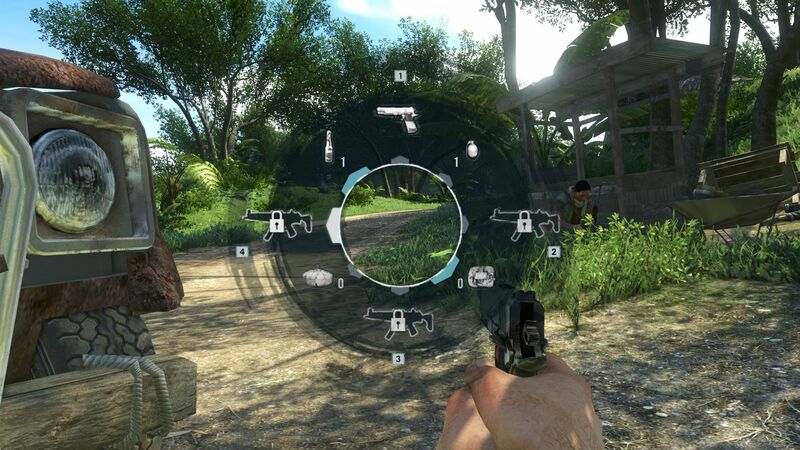 Few action games offer such a far range of sight. Tower conquests end with a neat tracking shot. 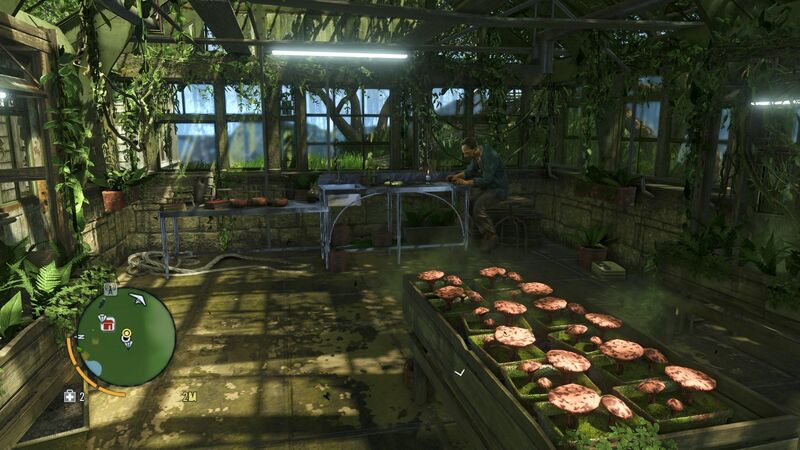 The developers overdid it a bit with the collectible plants. 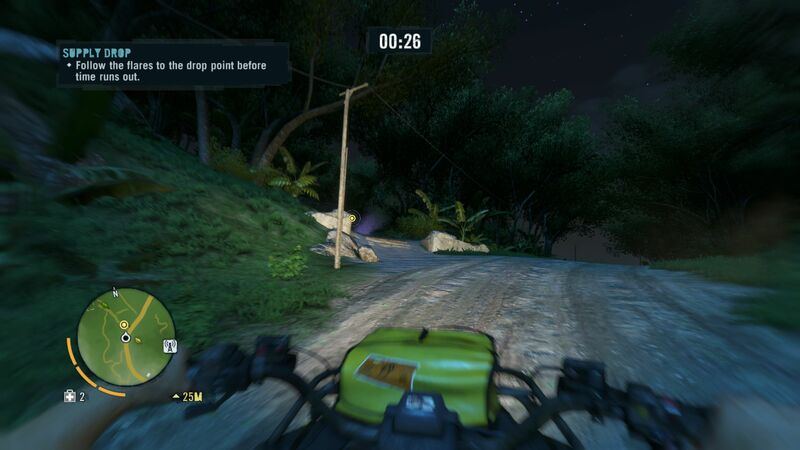 In terms of atmosphere Far Cry 3 plays in the top league. With the character and crafting systems, the ego-shooter is almost reminiscent of a role-playing game. 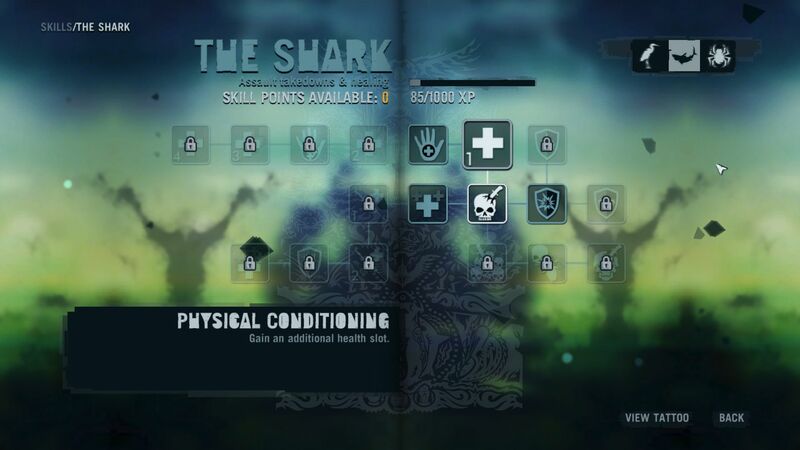 By collecting experience points the protagonist unlocks skill points, which we invest in the three talent trees "Heron", "Shark" and "Spider", however our fancy takes us. The practical improvements are doubtlessly one of the greatest motivating factors. The crafting system is also thrilling. 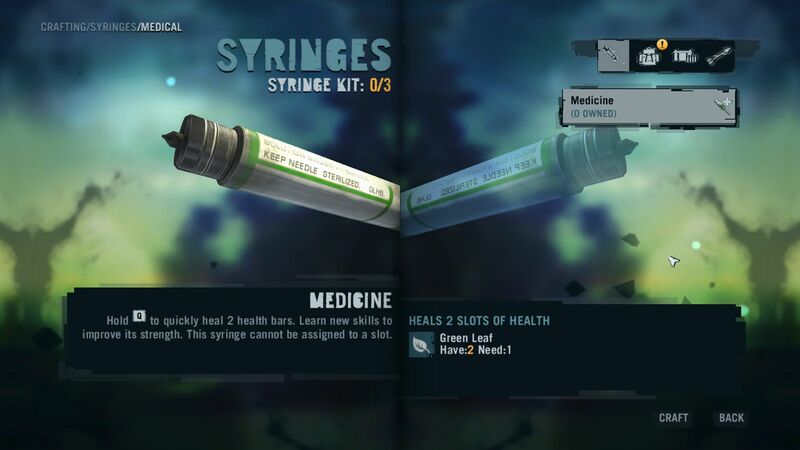 With materials that Jason collects he can produce his own healing concoctions or bigger ammunition bags. 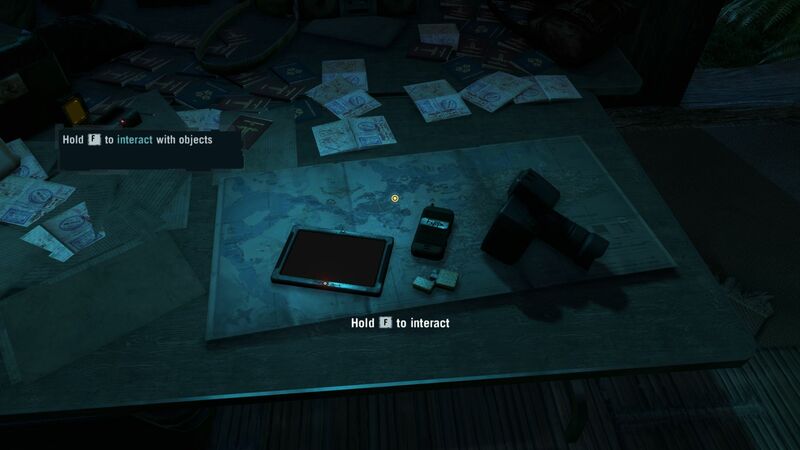 Since Ubisoft hammered the island with way too many boxes and plants, you should expand your inventory first. Most objects require special pelts, which we can acquire from specific animals at marked places (goats, wild pigs, deer, etc.) 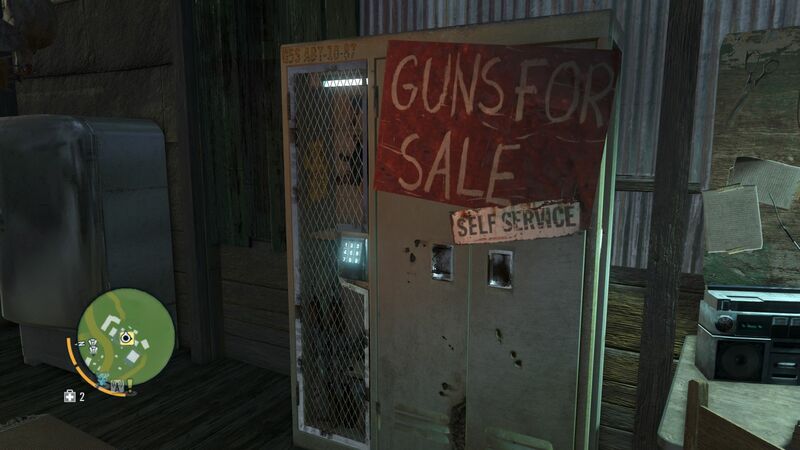 With the money we find we can purchase new guns of course. The light and mirror effects are sometimes too strong. ...where he consumes questionable substances. This isn't Alice in Wonderland, it's one of our main missions. At least the nasty drug trip is worth it. Does this sound to you like the perfect genre mix? Not quite, because of the sheer size of the game and its respective repetition - like in the last Far Cry - a certain arbitrariness looms. 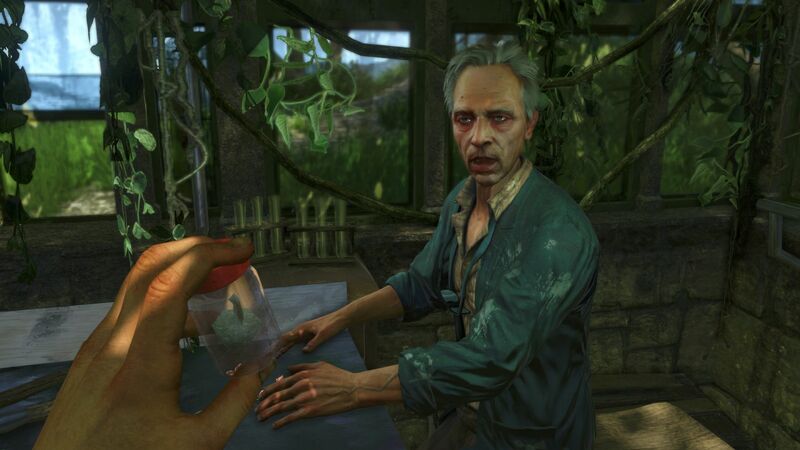 The principle quantity before quality reigns in almost all open-world titles. It would be hard for us to imagine that in the course of the expedition there are no moments in which the motivation breaks down. That's partly because the player soon begins to feel all-powerful. 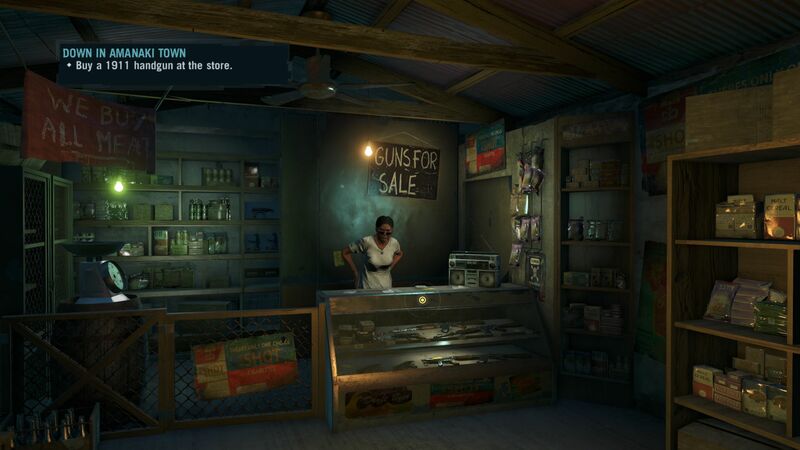 In Far Cry 3 you're showered too quickly with items and money. 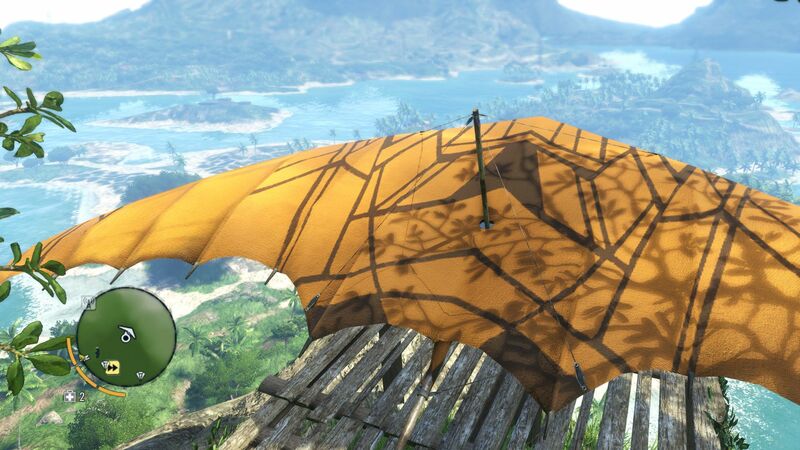 The abrupt changes in weather, the extremely bright color scheme (a slightly plastic look), the console-style menus and the missing physics bothered us as well. 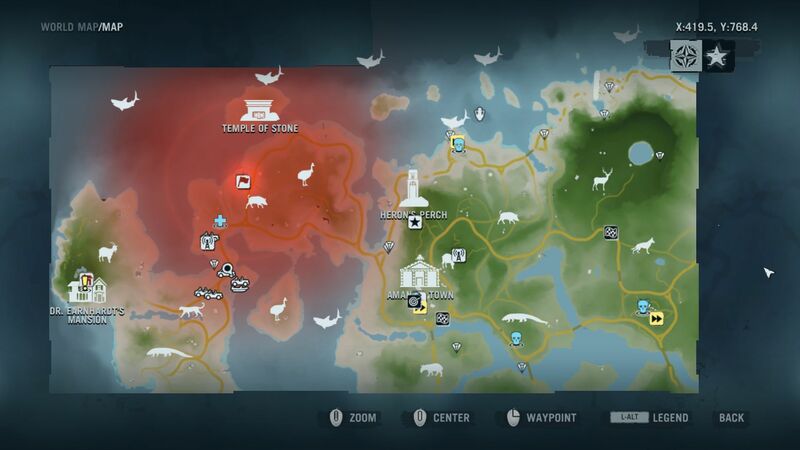 These are joined by an impractical save-system and limited mission areas. 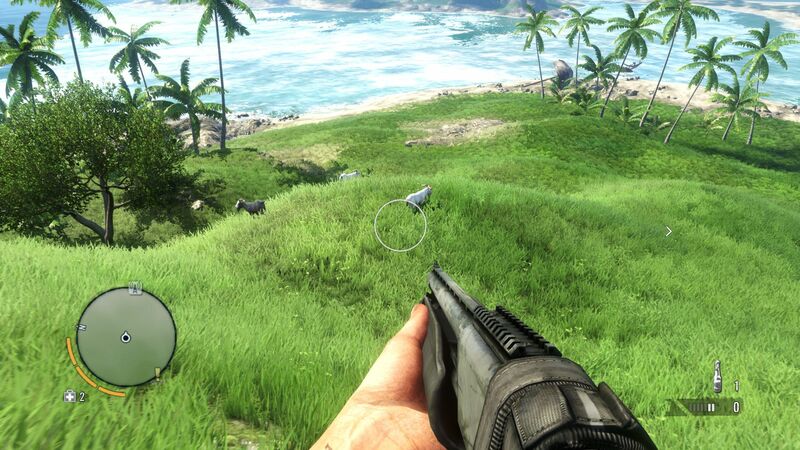 But when it comes to the most important ego-shooter characteristics Far Cry 3 does everything right. Thanks to the smooth animation and the good feedback (both acoustically and visually), the fights feel comfortably fluid. In terms of the KI-technology, the game leaves behind a patchy impression. Intelligent maneuvers (flank attacks) alternate with oafish actions (rushing forward blindly). But the great background music and the extremely thick vegetation easily overshadow that shortcoming. 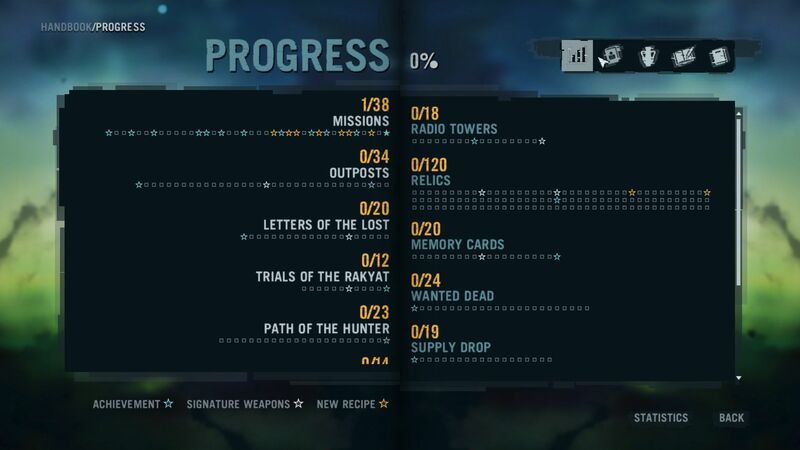 The weapon slots need to be released from time to time. Of course it's easier to fight in a team. When it comes to shooter mechanics, there's hardly anything to critique. We can take the pelts off of dead animals. 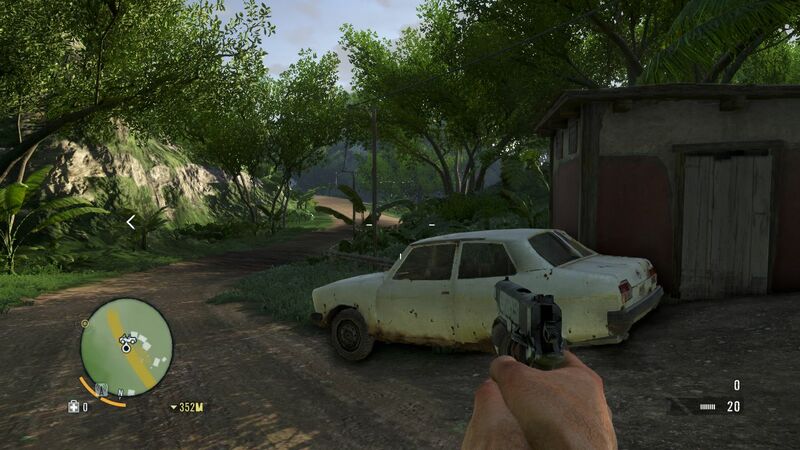 Far Cry 3 scores with a heavy degree of vegetation. We find ourselves in idyllic scenes continually. The benchmark sequence (a 40-second sprint through the tutorial village "Amanaki") is about average in terms of demand: there are passages that run more smoothly and scenes that stress the hardware more. According to our experience, 35 fps should be enough for proper gameplay. 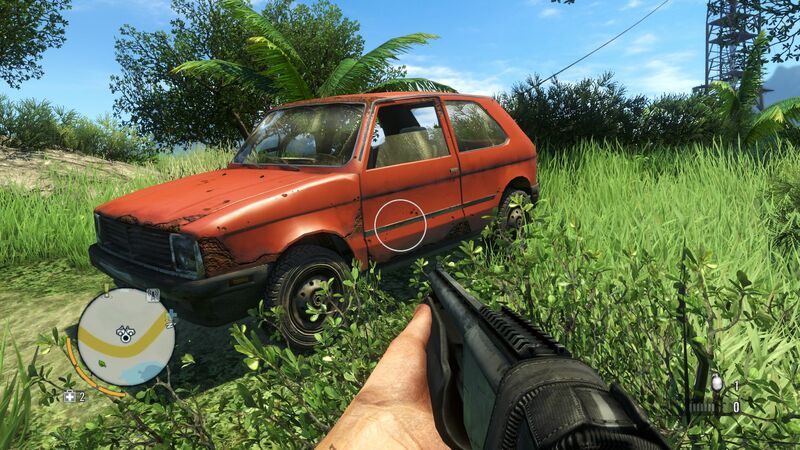 Although the texture sharpness and the polygon count aren't worthy of reference, the Dunia 2 engine is one of the best engines currently in production for the PC market. One of its greatest strengths is the incredible visibility. Depending on your position, you can overlook gigantic mile-long stretches. 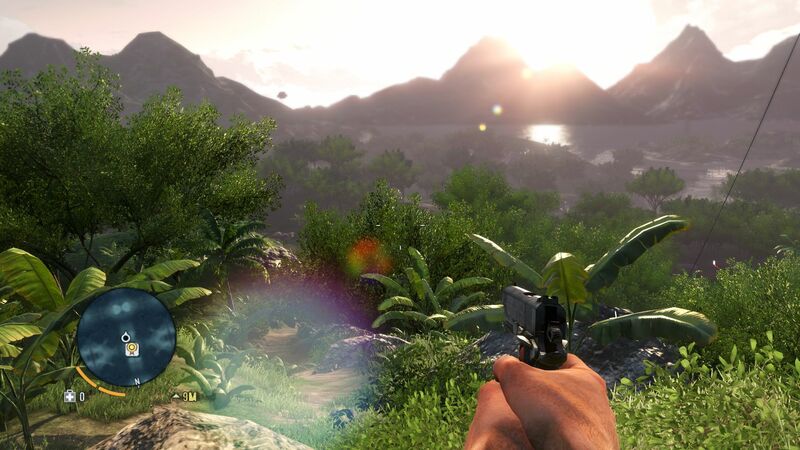 Lush meadows, majestic mountains, palm trees as high as towers: the ego-shooter unfolds a first-class atmosphere. The island world is framed by a beautifully reflective sea of water. The light and weather effects are just as impressive, although the picture is sometimes too bright and shiny. A shame: the technology isn't quite as high-quality as the Frostbite 2 engine (Medal of Honor Warfighter, Battlefield 3) or the CryEngine 3 (Crysis 2). But much of the action competition looks distinctly worse (Black Ops 2 and Borderlands 2 among others). 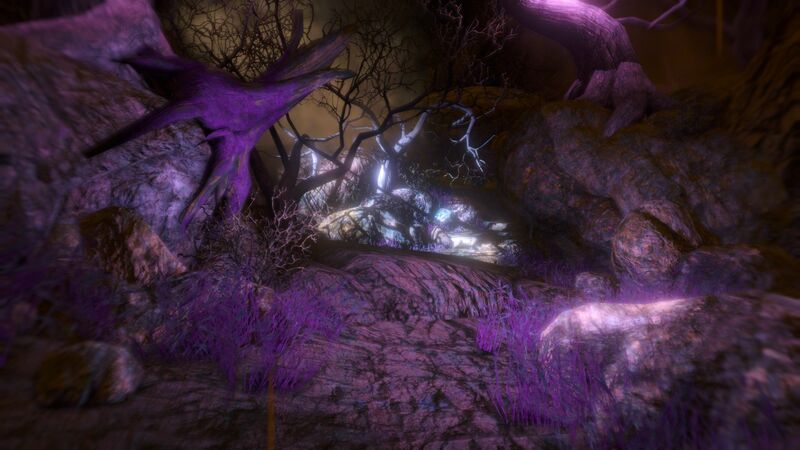 The extensive graphics settings point a finger at the loveless console porting. 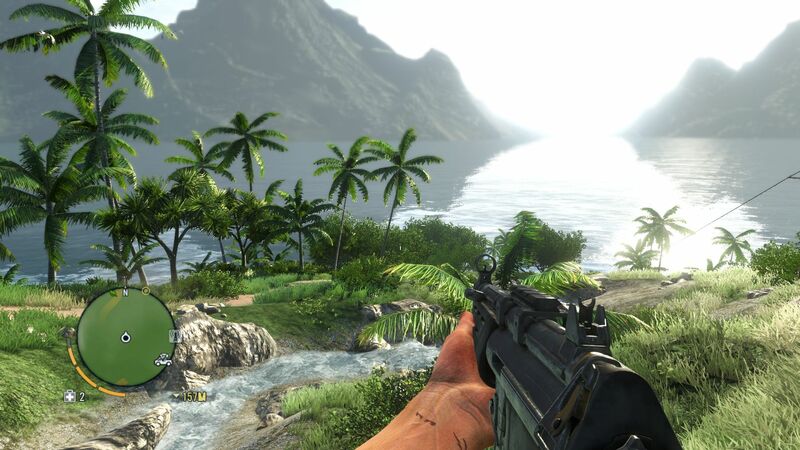 In order to appeal to as wide a range of customers as possible Far Cry 3 supports both modern DirectX 11 hardware and older DirectX 9 systems. With DX11 turned on the user can regulate the ambient occlusion variant (there's SSAO, HDAO and HBAO), the option "alpha to coverage" and the level of the MSAA anti-aliasing. 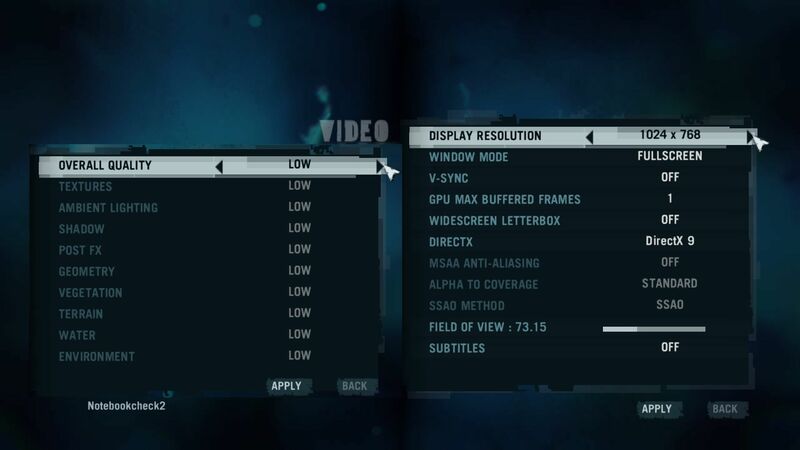 In the "video" menu you can also change the resolution, the picture mode and the field of vision. The vertical synchronization (prevents line adjustment) was deactivated for our benchmarks. For those who don't feel like messing with the advanced graphics options in the "video quality" menu, it's possible to just use the five presets. 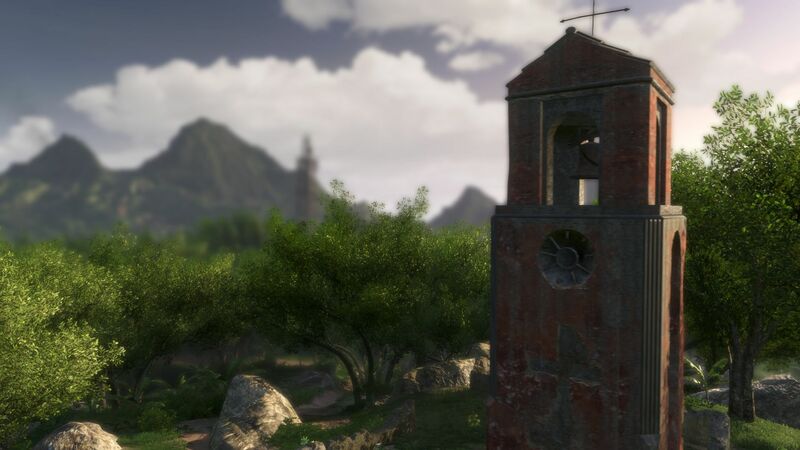 Worthy of praise: except for the DirectX mode, all settings are directly adopted into the game (though not always correctly, which is why we recommend restarting). 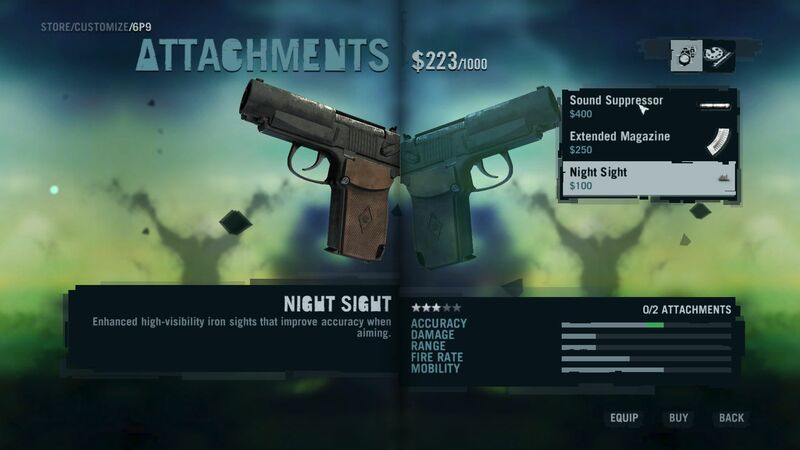 Cool: the weapons improve with upgrades. The (expandable) inventory is filled rather quickly. The ego-shooter is almost like a role-playing game. 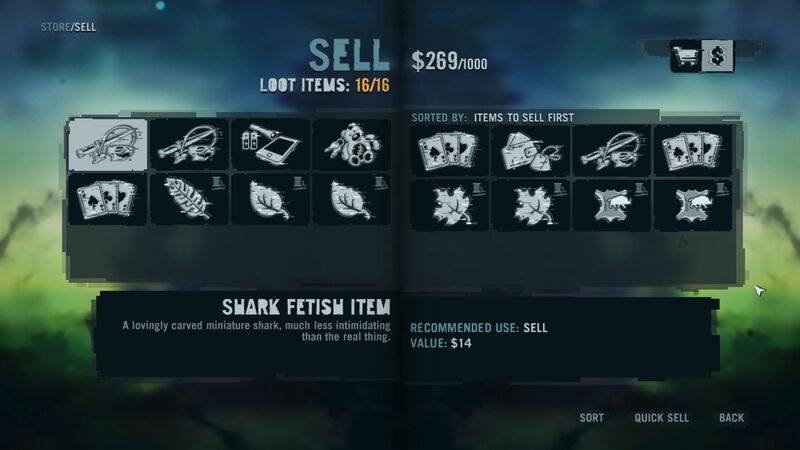 Collectible materials enable the protagonist to produce objects. The three talent trees ensure motivation. We only saw a fraction of the gigantic island. As expected, the ego-shooter functions with some pretty substantial hardware hunger. 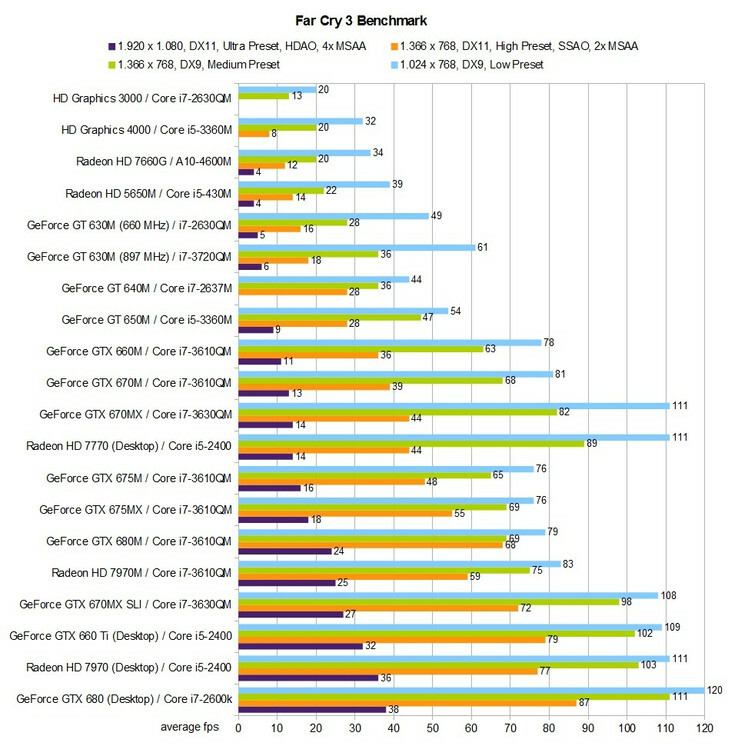 According to our benchmarks, entry-level solutions will get by only with low graphics options. While the HD Graphics 4000 processor chip only manages 30 fps when set to 1024x768 pixels and the preset "low", the old HD Graphics 3000 just struggles around the range of 20 fps - an unplayable result. 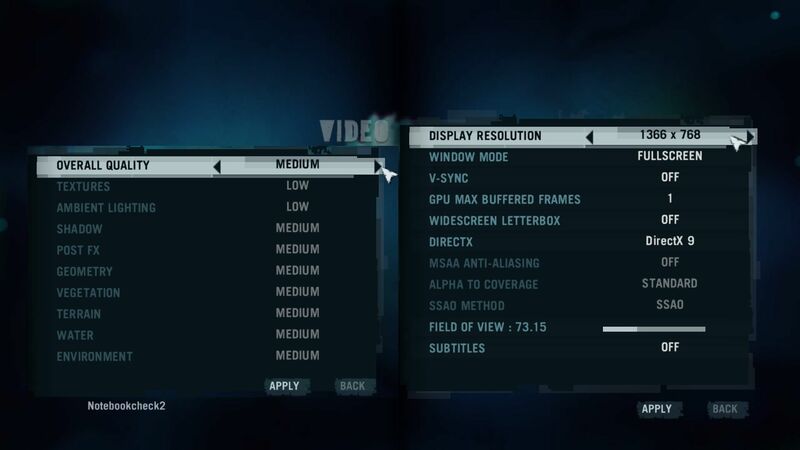 For the middle preset and 1366x768 pixels (DirectX 9) you'll need at least a GeForce GT 640M. For those who wish to enjoy a high level of overall quality and the DirectX 11 mode, including double anti-aliasing, you'll need a graphics card from the high-end segment (starting with the GeForce GTX 660M). 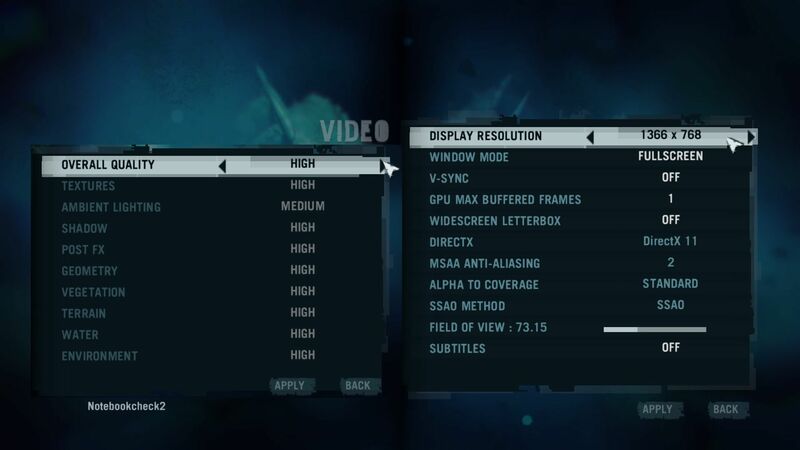 A combination of (very) high detail, multiple MSAA and 1600x900 and/or 1920x1080 pixels can be fueled only by absolute luxury GPUs, like the GeForce GTX 680M or the Radeon HD 7970M. Quadruple to octuple anti-aliasing should be generally ignored. 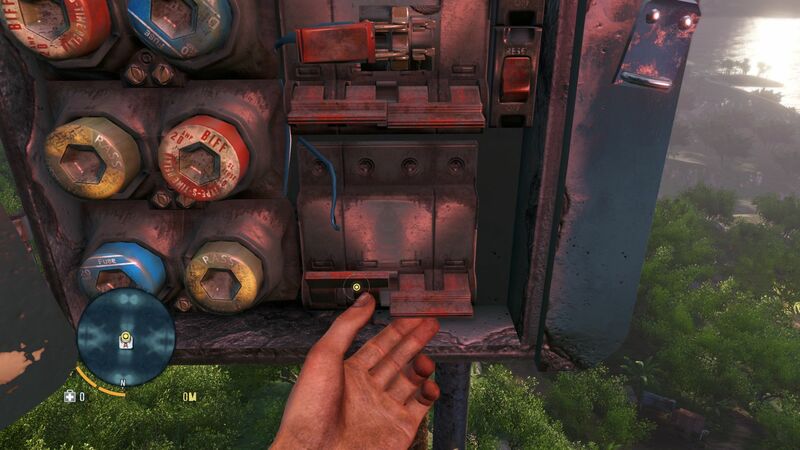 With all the controls set, Far Cry 3 jerks around even on potent gaming PCs. Similarly to Assassin's Creed III and Hitman: Absolution, with moderate settings the frame rate is sometimes massively dependent on the CPU. 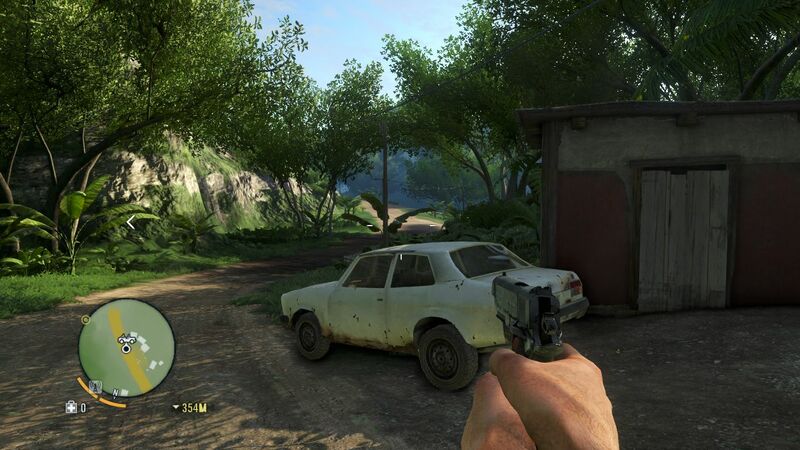 Far Cry 3 is a successfully developed action game which, with its open-world mechanics, makes a nice contrast to the predominantly linear shooter competition. But it isn't quite a top hit. Several shortcomings in terms of design as well as conception-related weaknesses tarnish the good overall impression. Thanks to the diverse possibilities and long playing time, the game is ideal for passing cold winter evenings. Longer routes can be crossed by quick travel or with vehicles. The wheels steer a little spongily. 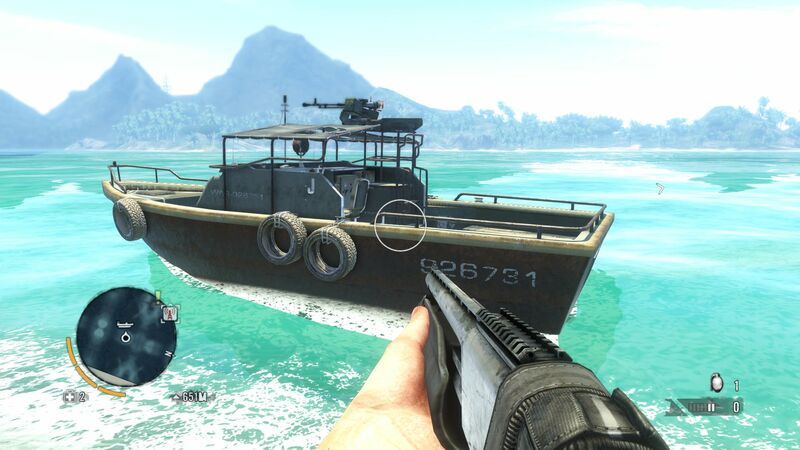 Guns are mounted on some boats. Cars serve for land exploration. The island is especially impressive from up in the air. GPU drivers: Nvidia 310.64 Beta, AMD 12.11 Beta 8 & Intel 9.17.10.2875.